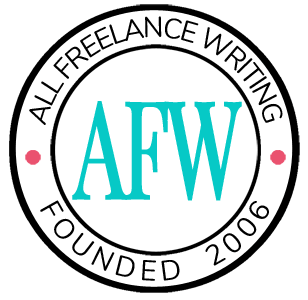 Every week I curate ads for the freelance writing job board here at All Freelance Writing. That means digging through a lot of garbage to find a few gems. And one type of ad I sometimes see deserves a bit of attention -- those with pay based on location. 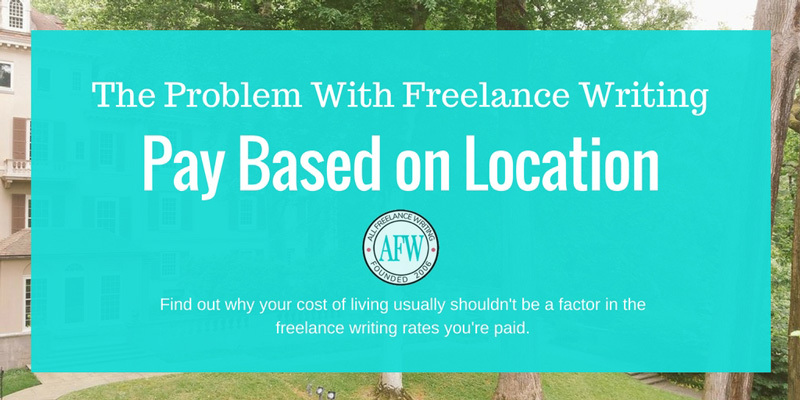 These are the ads that either outright say your pay as a freelance writer will depend on your location, or they list specific rates for one group of writers and another set of rates for writers in a different geographic area. Now, you might think this only happens internationally -- such as a US company paying US-based freelance writers more than, say, a writer in Asia for the same work. But I've more often seen this stated regionally. For example, a company based in NYC, or LA, or some other large city where the cost of living is high will offer higher pay for local writers than they offer for writers in more rural or suburban areas of the country (even though the work is the same and all of those writers work remotely). What's Wrong with Freelance Pay Based on Location? On the surface, this might not sound like a bad thing. It's just an urban company understanding local writers struggle with a higher cost of living, and they want to support those local freelancers. Right? That might be the intention in some cases. But it's a largely illogical way to determine pay rates, and it has the potential to be destructive. Let's pretend we're talking about a NYC client looking to hire US-based writers to create content for their blog. They offer $150 per post for local writers and $100 per post for writers based in lower cost of living areas, attributing the difference to cost of living. What's the difference in the value of each blog post in the above scenario? Assuming the writers have equal talent and credentials making them good fits for this gig, why is a post from Writer A worth more than a similar post from Writer B? It isn't. Not in the sense of the client's business. And freelancing is not an employer-employee proposition. Your location should only ever be factored into your rates if you choose to do that (and we'll get to why you shouldn't in many cases shortly). As a freelancer, the value you provide should affect the rate you earn (among other things). If the value of your work is $150 per post to that client, then that's what you should be paid, as long as that rates fits your own target. You can be paid less if you're less experienced, if your writing isn't as strong, if you don't bring specialized knowledge to a gig... but all else equal, you should not be paid less simply because of where you live. Another issue with pay based on location citing cost of living as the reason is clients don't actually know your cost of living. Tell me. Do you think you'd have a higher cost of living if you're a 20-something living in NYC, single, no kids, living with your parents or a couple of roommates... or if you're a 20-something, married, with two kids, and a homeowner a couple of hours outside that city? Writer A may or may not need as much as Writer B to support themselves. But the client assumes an increase in value (which doesn't exist) because they're also assuming a cost of living they know little to nothing about. Should a freelance writer in the suburbs automatically be paid less than one who does choose to rent in the city instead? Of course not. It has nothing to do with value and everything to do with cost of living assumptions which are irrelevant anyway. Let's say you're that suburban or rural Writer B clients assume are worth less because you have a lower cost of living. That lower cost of living isn't necessarily permanent. Now put on your business owner hat for a moment. If you can get the same value out of the work of two different freelancers, but you can pay one 33% less than the other (increasing your profits or decreasing your cost for other benefits you're seeking), who are you going to hire? Business owners don't pay more just because they can. Again, we're assuming all other things are equal between these two freelance writers vying for the same gig. So here's a buyer acting as though they care about local freelance writers by offering to pay them more. But then they immediately put them at a disadvantage by making them less cost-competitive than other applicants for the very same gig. That helps no one. It means the lower cost of living writers don't get paid what their work as been deemed to be worth. It means the higher cost of living writer has less of a chance of landing the gig because it becomes more expensive to hire them. And the client puts themselves at risk of not choosing the best freelancer for the job because suddenly cost becomes a significant deciding factor where it shouldn't. There's no need for any of that. There's no good reason for any client to advertise a gig with pay based on location rather than skills, credentials, and value. But what about when you set your own freelance writing rates? This is something I see more with freelancers working in international markets. Let's say you're a freelance writer in India for example, but you mostly work with UK clients. You might be inclined to set low rates because you perhaps have a lower cost of living. You figure it's a selling advantage that will attract more clients because it's cheaper for them to work with you. If you could be paid a fair market rate for what your work is worth, rather than what you think your location entitles you to, would you be happier hitting your income goals while having to take on far fewer projects? If a client's primary concern is cost-cutting, are those the kinds of clients you really want to cater to in the first place? If you're okay being paid less than you're worth, working harder than you have to, and catering to clients who don't respect the value you bring to the table, by all means do whatever you want. It's your career. But you don't have to put up with any of that. Think back to what I said using the US regional example too. Is your situation static? Or would you maybe like to move overseas someday? Do you want to travel more and embrace the digital nomad lifestyle? Will charging those lower rates help you do that? More likely, you'll end up stuck in a rut of working with low-paying clients. And if you do ultimately decide to change your living situation, you'll have to start over in a new market targeting better clients who pay you more. Having a low cost of living isn't something any freelance writer should be punished for. It's a benefit. Yes. Those in higher cost of living areas should be able to earn a living wage. But the benefit of a low cost of living is that you can earn as much freelancing and squirrel more away -- as an emergency fund, to travel, for retirement, or whatever you please. If you wanted location to influence your pay, you'd have settled for an ordinary day job with a local company. And remember, undercharging can hurt your overall professional reputation. I talked about this when I explained why you should publish your freelance writing rates on your business website. Low rates tells prospects you don't value your work as highly. And that... wait for it... leads to more stupid assumptions. They might assume your English isn't strong. Or they might think you're a beginner when you really have 10 years of experience. Or they might assume you simply can't write and will need your hand held more than most (potentially costing you gigs in the first place). Know what they won't assume? Your value suddenly increases just because you later decide to move to a higher cost of living area. To sum this up, the only time your cost of living or location should affect the rates you charge is when you need to charge enough to cover those costs and earn a livable wage. Anything beyond that is based on your actual income needs, your experience and credentials, and frankly what you want to earn. Don't let clients assign you lower worth based on where you live. And don't treat yourself that shabbily either.